Art from 1562 World Map by Diego Gutiérrez. I have always liked maps of all kinds from hand-drawn treasure maps you scrawled out on the back of your ruled notepad paper as a kid to professionally crafted cartographer’s world maps. I have a significant map collection myself. There are some maps that have practical purpose and get used often (like local trail maps) and there are others I have just to have them (like my shaded relief map of Antarctica). Historically, cartography was an important art form and maps were an ever-changing representation of our knowledge of the physical world we lived in. The words “Terra Incognita” on a map have been the inspiration for many an expedition. The progression of the complexity and accuracy of maps throughout history is a direct link to our technological advancement as a culture. Maps are used to present information about a place, therefore, there are as many different kinds of maps as there are data to study (weather, geology, geography, traffic, population density, flora and fauna, water distribution, zoning, political, etc). For our purposes we are more concerned with the typical maps we would use for travel and navigation. There are four primary styles of maps typically used to supply road and trail information for would-be travelers. Most basic type of navigational map. This is the most basic of maps we can use. Typically it has little or no data regarding terrain and is often not drawn to any definable scale. Named roads and marked trails are illustrated and labeled, maybe some key features of the area are called out and there might be some trail distance data. Most of the time these maps will also label North for reference and even if they don’t, it is normally safe to assume that North is toward to the top of the page. You’ll find these maps printed for use in smaller local parks where “navigation” is not considered necessary. These are not the best maps to use for navigation but in a pinch, they can still be better than nothing. Road Atlases and National Forest Maps are typically little more than detailed road and boundary maps. Your typical state maps you can pick up at any gas station or thick road Atlas used for cross country travel are pretty common road maps. The focus is on known, paved roads with some information on maintained dirt roads and trails. These are great maps for traveling long distances by vehicle and tend to have relevant data for that type of travel. These emphasize main highways, towns and state boundaries, popular areas of interest and note road distances between towns and cities. Very popular and very useful when travelling by road and planning long distance trips but of little use in the backcountry. Pre-color base shading for a shaded relief map. Shaded relief maps are visually stunning and some of my favorite maps to look at. They beautifully represent land contouring and geological features through detailed shading giving an almost 3D effect to the map. On their own, they are little more than works of art but when combined with detailed road and topographical data they are incredibly useful and actually make topography easier to read. They also use a more real-world color palette to represent the land (i.e. browns for desert, greens for alpine and wetlands, white for snow, blue for water, etc.). By using shaded relief techniques on top of road, trail and topo data, map reading can be much easier and more intuitive for the average user. Multi-layered map data with accurate topography is ideal for backcountry navigation. For backcountry navigation, nothing beats an accurate and up-to-date detailed topographic (topo) map. It is the best map for accurately reading terrain and land forms in the field. When layered with road and trail data, boundary information and shaded relief graphics these maps create a very complete picture of the physical world around you. Topo maps use contour lines at set intervals to illustrate relief (see below for more on contour lines and reading topography). For the most part, these are the maps you want to have in the field when trying to navigate. These maps show not only the contours, but also any significant streams or other bodies of water, forest cover, built-up areas or individual buildings (depending on scale), and other features and points of interest. Landmarks and landforms on topographic maps are easily recognizable and make navigation much easier. If you have a lot of maps, or a lot of experience with maps, you’ll learn to place your trust in certain cartographers and map developers. This can vary locally as some small producers are responsible for fantastic local maps but don’t offer anything outside that region. For example, here in Arizona there is a set of trail maps produced by Emmett Barks Cartography for Flagstaff and Sedona. That’s all they do, but they do it really well and produce really nice maps based on up to date information (they generally update there maps every couple of years). I’m also a fan of the trail maps produced by Beartooth Publishing and have grown to trust their products as well. National Geographic maps are widely known and respected as well and most of the printed 7.5-minute maps I buy here are National Geographic publications. This is also where most maps will list their source material which can be important for determining accuracy of information. One Emmett Barks map I have lists USGS, Forest Service Maps, City maps and county GIS data as their primary source information with trail routes and distances provided by multiple GPS tracks compiled and edited. Maps using a single source of data are less likely to be completely accurate. The United States Geological Survey (“USGS”) is a federally chartered organization charged with providing “geologic, topographic, and hydrologic information that contributes to the wise management of the Nation’s natural resources.” Nearly all published topo maps will use USGS information as their primary basis. The developer will generally provide the basis data for their maps including the reference datum and projection method. This is important to know if you are comparing multiple maps or if you need to communicate your position. There are generally two different datum references in use in North America and they differ slightly so it’s good to know what you’re working with. NAD27 is a North American based geodetic reference system established in 1927 and is wide use across North American maps, the other is NAD83 and is a based on a global reference. The two can be off by a handful of meters from each other. The most common is NAD27 and my preference for North American maps. Also of some importance here is the projection method used to lay out the map. The large majority of North American maps will be Mercator projection maps, which uses a straight line grid making navigation easier but becomes extremely distorted toward the poles. I’ll cover the Universal Transverse Mercator (UTM) grid a little more in a minute. Interesting Note: Google Maps uses a projection method called Web Mercator (or Spherical Mercator) which is a variation of the UTM projection method and is not recommended for accurate navigation. This is pretty straight forward but, again, important if you have to communicate your location to someone. Forest Service maps, city maps, trail maps and USGS 7.5-minute maps all vary slightly in assumed accuracy. It won’t really matter while it’s in use, but could be valuable information when passing on your location so that everyone is on the same page. The map name will be on the cover of folded maps or in the lower right corner of USGS 7.5-minute maps. Most detailed maps will include at least a basic symbols legend to let you know how they mark specific areas and features on a map. Some symbols are pretty universal like a tent-shape denoting campsites, or a picnic table denoting day-use picnic areas. But all maps have their own vernacular that varies slightly from the others. The USGS has standardized their symbols library for use across their collection of topographic maps but the legend is not generally printed on individual 7.5-minute topo maps, so you would need to download the USGS Symbols Legend and familiarize yourself with their standards or risk a misunderstanding in the field. New Shaded Relief mapping is changing some of the traditional color representations to make them more intuitive, but there is still the need of a legend to clarify and define the language used for each map. Some maps use color to represent elevation instead of land character which can get very confusing if you don’t know that from the beginning. Before heading out with any map you may have to rely on, be sure you are at least partially familiar with what the lines, shades, symbols and numbers all mean. Two of the biggest pieces of information for active navigation using a topographic map is the contour interval and the map scale. You’ll rarely see a scale note on simple line maps, but all others should offer a graphic scale (like the one shown above) for measuring distances on the map. Most compasses will have common scales printed on their edges for use while navigating and you can purchase map rulers at different scales which can be useful if you do a lot of land navigation. Scale should be one of the first things you look at when using a new map, and take some time to get sense of how that scale relates to your map. Why is this such a big deal? If you’re low on resources and need to get to a road, camp or water source on the map and you get the scale wrong you could be in a world of hurt. Or say you want to summit a peak and you misread the scale and misinterpret the contour interval you could have a really bad day. On the right side of the image above you’ll also see the Key Map which shows where in the state this map section represents. We covered how declination works in the Compass Basics lesson. Most topo maps that would be used for backcountry navigation have a specific declination and it will be noted or illustrated somewhere on the map. The typical declination graphic (shown above) will illustrate the differential angle between True North (TN) and Magnetic North (MN). Sometimes there is also notation of Grid North (GN) if the map’s grid differs from both TN and MN. As I mentioned in the Compass Basics, it is important to pay attention to the date the declination was noted on the map. Older maps will likely have outdated information and can throw off your navigational readings. Some maps will state the declination adjustment for that area so you can calculate the current declination with a little math. My suggestion: for local navigation, just keep yourself up to date on the declination in your area and ignore the printed data. To simplify the use of maps and to avoid the inconvenience of pinpointing locations on curved reference lines, cartographers superimpose on the map a rectangular grid consisting of two sets of straight, parallel lines, uniformly spaced, each set perpendicular to the other. This grid is designed so that any point on the map can be designated by its latitude and longitude or by its grid coordinates and a reference in one system can be converted into a reference in another system. Such grids are usually identified by the name of the particular projection for which they are designed. So, Grid Units are a method of segmenting a map for easy reference and is typically related to the form of projection used. In most cases when a map uses UTM projection, the grid units will be based on the UTM grid (Lat and Long may be shown as well as a secondary grid). Longitude and Latitude is an older, slightly outdated, mapping grid system that is still in use and still represented on most maps (even if UTM projection is used). Most of us learned about Long and Lat in elementary school and have noted the iconic lines on the typical classroom globes. The “latitude” of a point on the Earth’s surface is the angle between the equatorial plane and the straight line that passes through that point and through (or close to) the center of the Earth. Lines joining points of the same latitude trace circles on the surface of the Earth called parallels, as they are parallel to the equator and to each other. The north pole is 90° N; the south pole is 90° S. The 0° parallel of latitude is designated the equator, the fundamental plane of all geographic coordinate systems. The equator divides the globe into Northern and Southern Hemispheres. The “longitude” of a point on the Earth’s surface is the angle east or west from a reference meridian to another meridian that passes through that point. All meridians are halves of great ellipses, which converge at the north and south poles. The meridian of the British Royal Observatory in Greenwich, a little east of London, England, is the international Prime Meridian although some organizations—such as the French Institut Géographique National—continue to use other meridians for internal purposes. The Prime Meridian determines the proper Eastern and Western Hemispheres, although maps often divide these hemispheres further west in order to keep the Old World on a single side. The antipodal meridian of Greenwich is both 180°W and 180°E. This is not to be conflated with the International Date Line, which diverges from it in several places for political reasons. The combination of these two components specifies the position of any location on the surface of the Earth, without consideration of altitude or depth. 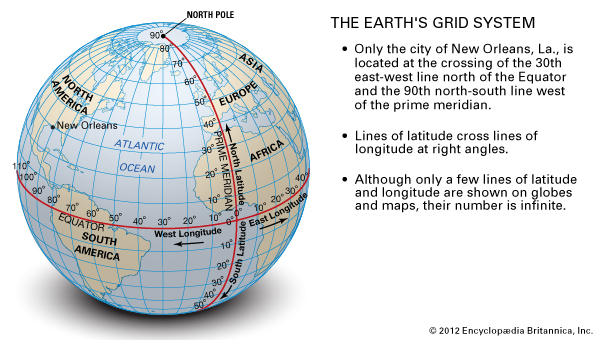 The grid thus formed by latitude and longitude is known as the “graticule”. The zero/zero point of this system is located in the Gulf of Guinea about 625 km (390 mi) south of Tema, Ghana. The National Imagery and Mapping Agency (NIMA) adopted a special grid for military use throughout the world called the Universal Transverse Mercator (UTM) grid. 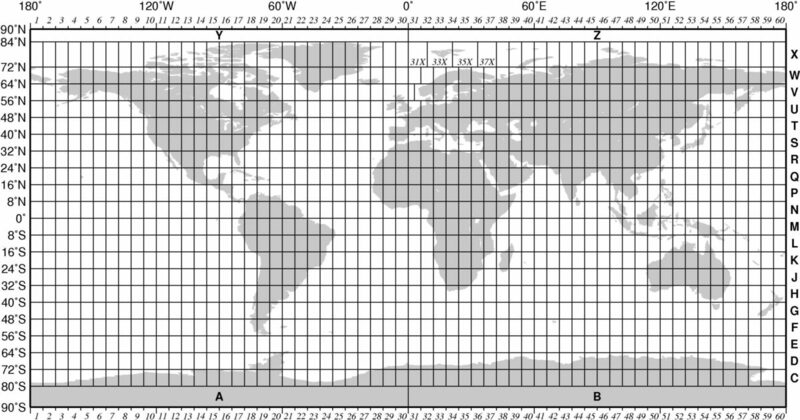 In this grid, the world is divided into 60 north-south zones, each covering a strip 6° wide in longitude. These zones are numbered consecutively beginning with Zone 1, between 180° and 174° west longitude, and progressing eastward to Zone 60, between 174° and 180° east longitude. The contiguous 48 States are covered by 10 zones, from Zone 10 on the west coast through Zone 19 in New England (Arizona is zone 12S). In each zone, coordinates are measured north and east in meters. The northing values are measured continuously from zero at the Equator, in a northerly direction. To avoid negative numbers for locations south of the Equator, NIMA’s cartographers assigned the Equator an arbitrary false northing value of 10,000,000 meters. A central meridian through the middle of each 6° zone is assigned an easting value of 500,000 meters. Grid values to the west of this central meridian are less than 500,000; to the east, more than 500,000. Virtually all NIMA-produced topographic maps and many aeronautical charts show the UTM grid lines. The UTM grid is shown on all quadrangle maps prepared by the U.S. Geological Survey (USGS). On 7.5-minute quadrangle maps (1:24,000 and 1:25,000 scale) and 15-minute quadrangle maps (1:50,000, 1:62,500, and standard-edition 1:63,360 scales), the UTM grid lines are indicated at intervals of 1,000 meters, either by blue ticks in the margins of the map or with full grid lines. The 1,000-meter value of the ticks is shown for every tick or grid line. The actual meter value is shown for ticks nearest the southeast and northwest corners of the map. Provisional maps at 1:63,360 scale show full UTM grids at 5,000-meter intervals. Alright then! All the basics aside, let’s get into the nuts and bolts of understanding topography. We’re going to try to keep this really simple and once you understand how it works, it’s fairly intuitive to read. You really just have to remember that we’re reading a 3-dimensional object in 2-dimensional space. Working on flat paper it’s easy to graphically represent the two dimensions of length and width. The challenge then, for a 3-dimensional surface, is to graphically show height as well. Throughout the history of cartography, 3-dimensional relief has been illustrated in a variety of ways, few of which were accurate. Most of the representations were simply graphic indicators of mountainous regions, canyons or river valleys to communicate the rough character of the terrain. Today, accurate presentation of height and depth on maps is illustrated using topographic contour lines. Height and depth on maps and charts is referred to as relief and is represented by imaginary lines called contours. Contours, or isolines, represent the physical intersection of the bounding edge of a 3-dimensional object when sliced through at set intervals parallel to a given reference. The image below is the best representation of the way I was taught to view contour lines. The dashed lines (shown at 25 unit intervals) represent the horizontal slices through the object. The intersected edge at each interval is then projected onto the 2-dimensional map giving us a fairly clear graphic representation of the 3-dimensional object’s shape and height. As the diagram notes, the tighter the contour lines are the more steep the slope and the more spread out they are the more shallow the slope. The tighter the interval between contour lines, the more accurate the representation. The contour interval is the vertical distance between two adjacent contour lines. The tighter the interval, the more relief detail can be illustrated. Working with smaller maps of individual properties I am used to seeing one-foot intervals which provide a pretty clear picture of how the land is shaped. At larger scales, this tight interval is not practical and would render the map unreadable. For larger scale maps, intervals of 10-foot, 20-foot, 40-foot or 50-foot are common. This is extremely important when estimating slopes and identifying potential routes on a map. The trade-off for better readability is less fine detail of relief elements. Section of 7.5-minute USGS map showing a 40-foot contour interval. Index lines on a map are heavier (thicker) contour lines every 4th or 5th contour and are usually labeled with the elevation reference. So, for example, on USGS 7.5-minute maps the interval is 40 feet. So all contour lines represent a difference of 40 feet in elevation and every 5th line is emphasized as an Index line so the interval between Index lines is 200 feet. Index lines will also be labeled with an elevation number allowing you to quickly reference your vertical position. With few exceptions, elevations will be noted in feet or meters from sea level. Take some time to look over your maps and get to know how they’re put together: Who made them, how they’re projected, the basis for the data as well as the age and accuracy of the information presented. Next we’ll put the Compass Basics and Map Reading Basics together and work on some real-world navigation exercises. Very interesting and informative article! It HAS been a long time since I actually looked at a map. This was a great refresher on my college Cartography course! I was hiking with some people last weekend and I realized the “experienced” member of the pair THOUGHT he knew how to read a topo map but had no conception of scale or topography! I take it totally for granted that topo lines make sense to people: I look a them and just “see” the land. To complement the Montana and Sedona based cartographers I recommend Latitude 40 for Colorado and the Moab area! Thank, Beth. I’m like you in that I see and read topography very easily. I’ve had a lot of practice and work with it daily, so I forget that some people just won’t understand the language. But luckily, it’s easy to explain most of it if you find someone who needs a little help. Thanks for the tip to Latitude 40!